Jim Wallis has been making a rather big splash lately. 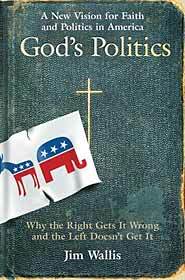 His new book, God's Politics : Why the Right Gets It Wrong and the Left Doesn't Get It is currently number 10 on the Amazon Bestseller List. He has made appearances all over the TV, reiterating his key idea: He believes that God cannot be pleased with the Right's definition of what "moral values" are, and he cannot be pleased with the Left's total disregard of moral/religious issues. Read the review, and Jim is certainly a sincere, nice guy, a guy that hits some of the problems correctly. Still, a lot of this article looks like sloganeering, filled with very vague ideals. It's altogether possible--indeed, one would hope--that the book itself gets down to brass tacks, and also that it doesn't continue the straw-man building that comes through in this short article (what in the world is a "purely military solution", and who short of Rambo supports such?). I'm skeptical, though, of Jim's ability to find "pro-poor" solutions that doesn't march down the same big government path that has failed us for a generation now. We'll see; read it and tell me how he comes down on that stuff, Bob.